There is a significant amount of innovation and product realisation around autonomous vehicles in agriculture (both aerial and ground). E.g. the Spirit autonomous tractor and Project Ursula. It is not only the commercial world that has taken to this technology. There is a whole open source DIY community focused on building autonomous vehicles. Although not specifically aimed at agriculture, DIY Drones along with it’s partner 3D Robotics has developed hardware and software capable of controlling unmanned planes, …copters and rovers. The beauty of this is that the software is essentially free and the hardware is reasonably priced and readily available. Also, there is a community that is openly discussing and evolving the project so it is relatively easy to troubleshoot and learn a bit of what goes on behind the scenes. A few months ago I took the plunge and ordered the hardware needed to build an autonomous vehicle. I designed and built a small rover that uses two 500W electric motors as it’s ‘powerhouse’. It works with tank style steering. It is essentially a large remote controlled car. The ArduPilot Mega (APM) sits between the remote control receiver and the motor controller (Sabertooth 2×60). The APM has an internal compass, external GPS and an external radio transmitter/receiver. 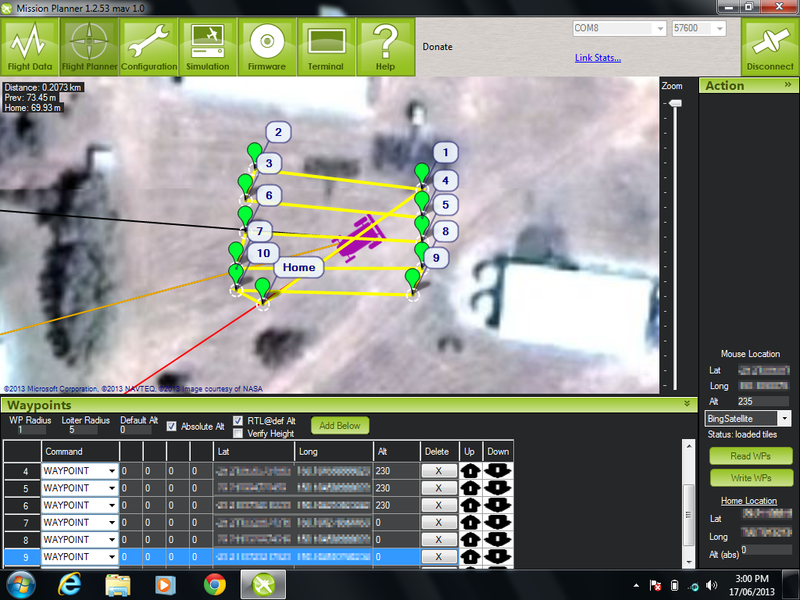 Using the Mission Planner software you can set waypoints that the rover follows. The rover’s GPS position, speed and other information can be monitored from within the Mission Planner software as the rover completes it’s mission. I have put together a small video that shows the basic operation of the autonomous vehicle. Autonomous Vehicle Project from bboughton on Vimeo. The question you are probably asking is ‘Why is this significant?’ or ‘Whats the point?’. The answer is that it is part of the next step in agriculture. Queensland University of Technology (QUT) is involved in similar research. Imagine a fleet of small autonomous vehicles sent to patrol the summer fallows to keep them weed free. For me, building a simple autonomous vehicle of my own shows that the technology exists, it is not that expensive and commercially, shouldn’t be to far away. My next steps are to use sonar sensors to implement object avoidance. Further down the track I will think about mounting a camera or some other sort of sensor to collect data. The rover’s path can be set inside the Mission Planner software.